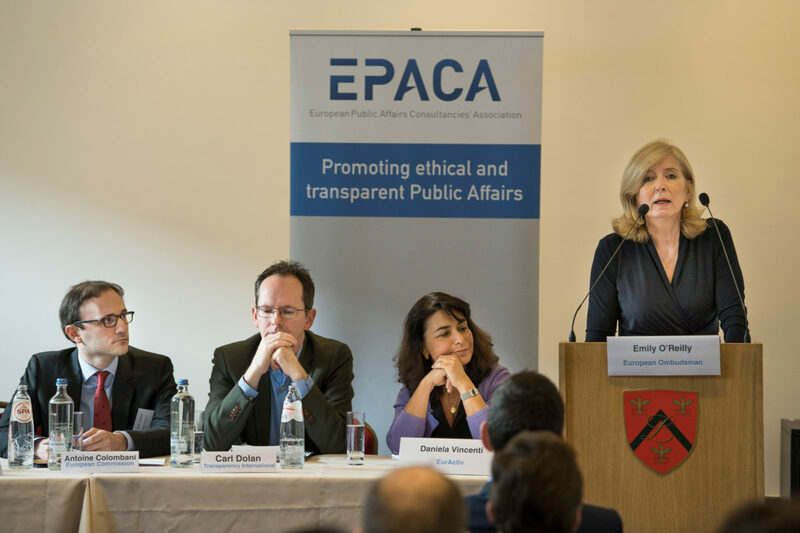 On 7 November, in a week where the Paradise Papers brought forward new questions about corporations, tax and the relationship between business and state, EPACA hosted a panel discussion on the future of transparency in Europe. The discussion, which featured a keynote speech from European Ombudsman Emily O’Reilly, focused on how the Transparency Register can be improved as a tool to ensure policy debates are held in an open and honest way. It was agreed that the Register is a key component of open policymaking but, as was noted by the Ombudsman, the current Transparency Regulation dates from 2001. This, she said, predated “the creation of new technologies that have obliterated old notions of communication, of privacy, but more than anything have helped dramatically to reshape the landscape of actual control and influence.” More than that, the quality of information on the Register can be poor in some cases, and its non-binding nature means it can be avoided by those seeking to advocate without disclosure. EPACA has been a leading figure in this discussion for more than a decade. It was therefore encouraged to see commitment from the Council, represented by the Estonian Permanent Representation, to move forward with reforms to the register. While challenges remain in finding alignment between 28 Member States on the precise details, the Estonian speaker was confident a general approach could be found by the end of the year. For Carl Dolan, head of the European wing of Transparency International, the EU is already transparent in a number of key areas. Notably, he cited the Brexit negotiations as being “exemplary” in terms of transparency. Nonetheless, issues remain, including the trilogue process as well as the poor quality of data on the Register. In order to be able to best maintain the register, the Commission said in response, more resources would be needed. Currently the Council is moving towards agreement on its position for the new register. Once finalised, discussions between the Parliament, Commission and Council will begin. Carol Dolan pointed out it would be inconsistent for such discussions to be held behind closed doors and, in response, the representative of First Vice President Timmermans noted that, where possible, discussions on the new regime would be open and public. You can find the full speech of the Ombudsman here.